OLATHE, Kan. — Terracon, a leading provider of environmental, facilities, geotechnical, and materials services, is pleased to announce Oswaldo (Ozzy) Bravo, P.E., M.ASCE, has been selected to receive the 2018 Edmund Friedman Young Engineer Award for Professional Achievement by the American Society of Civil Engineers (ASCE). Bravo is a senior associate in Terracon’s Lenexa, Kan., office specializing in bridge and highway design-build projects. As a project engineer, he provides analysis, calculations and engineering recommendations on large transportation design-build projects for regional and national clients. He joined Terracon in 2013. The prestigious award recognizes a younger member of ASCE who has advanced the profession; exhibited technical competence, high character and integrity; developed improved member attitudes toward the profession; and contributed to public service outside his/her professional careers. He was previously recognized by ASCE with the New Face of Civil Engineering Award and continues to serve in leadership roles with the Kansas City section of ASCE. Bravo has been recognized by several organizations for his professional, civic, and community involvement, including the 2018 Rosa Parks Diversity Leadership Award from the Women Transportation Seminar in Kansas City; the 2017 Terracon Young Professional Award; the 2017 Engineer of the Year designation from the Kansas Society of Professional Engineers Eastern Chapter; and the 2017 Faithful Friend Award by the Friends of Johnson County Developmental Services. He currently serves as chair of the Industry Leadership Development Council for the American Road &amp; Transportation Builders Association (ARTBA), and on the Diversity and Women Advisory Board at the University of Kansas School of Engineering. “It is my responsibility and privilege to share my acquired skills with others and to support them in achieving the same opportunities I have achieved in my own life,” Bravo said. 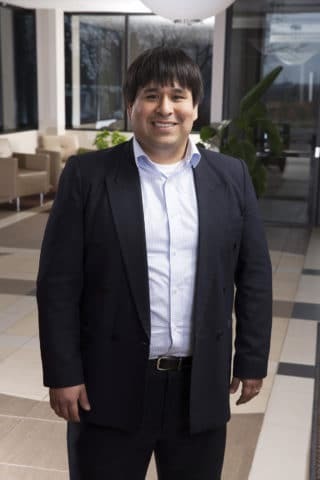 A native of Peru, Bravo has 10 years of experience in civil and geotechnical engineering in the U.S. He is a licensed professional engineer in Kansas, Missouri, Minnesota, Iowa, Illinois, Texas, and Arizona. He earned his bachelor’s degree in civil engineering at the University of Kansas and his master’s degree in geotechnical engineering at Texas A&M University.